"When you are at speed, there is no fear." Le Mans racing is perhaps one of the most mystical and intense of all racing sports. It might not be the fastest or flashiest of the auto domain, but it has a certain something about it that draws fanatic audiences and devout worshippers. For those unaware, the 24 Hours of Le Mans is a race series, primarily known for it's multi-class car competitions in which the participant vehicles must endure 24 hours to complete the race. This extreme, epic event is quite special in the world of racing, because of its pure test of drivers, cars, and engineering crews. All of them must endure incredible strain and wear, without rest or break, for an entire day. There's a romance here to this focus and devotion that's hard to define, but it is definitely there. Speed Tribe is best described as a total immersion into the world of Le Mans from a very artistic and focused approach. There's no narration, technical details, or usual sports-like coverage. Instead, footage from the 2001 24 Heures de Le Mans in France is compiled into a thought-provoking, beautiful, and well composed 25-minute moving artwork. Accompanying the footage of the race is a multi-textured soundtrack composed and produced by Daniel Bressanutti and Patrick Codenys, best known for their membership in the near-legendary electronic music act, Front 242. The resulting audio/visual experience is impressive to say the least. While race fans might get more out of the disc than most people, it's still an unquestionable masterpiece, despite the running time that may sound short, but is actually the perfect length. The pace of the program is quite clever, starting off rather boldly—and loud—with the opening ceremonies of the race and the first few laps. Those who watched the 2001 Le Mans will remember that shortly after starting, the race was inundated with heavy rain when a tremendous storm hit, and with that, the film takes a slightly different tone, becoming more ethereal and ambient. Slowly nightfall covers the track and we see the blur of tail lights and red-hot brake discs circling the track along with highly stylized in-car footage. The film slows down, appropriately so, as the early morning hours approach when most of the spectators have long since gone home and the crews and co-drivers try and get some sleep. This soon changes so as the film heads back into an intense pace (with perfect musical accompaniment) as the crowds come back and the excitement builds for the final 6 or so hours of the race. As the winners (Team Audi) celebrate the win, the film builds to a chaotic close and we've just experienced a quick, capsule dose of Le Mans. Beautiful and even disturbing in a way, Speed Tribe conveys the essence of racing, at least from a fan point of view, perfectly. For those who aren't connoisseurs of European racing sports, there may be little draw to this disc other than it's spectacular production values and technical merits. But for those attracted to the world of Le Mans, it will also be a fantastic way to remember the 2001 race in a radical and highly skilled way, and that's just "version 1." The disc also contains an alternate version of Speed Tribe, simply called Version 2 which is a slightly different approach to the presentation. Version 2 is a more surreal, meditative experience, that uses slightly different footage, different visual effects and editing techniques, and a different soundtrack, geared down a bit to be more ambient and environmental. The scenes that are also in the first version appear with desaturated colors or distortion filters, making a more dreamlike presentation from something already very hallucinogenic. Both versions go hand-in-hand, like the light and dark side of racing. In its totality, Speed Tribe is much more than just a sports compilation or a re-cap of an event; it's a frozen artifact of the event suspended in its own little world, which is no small feat to accomplish. Image Transfer Review: Shot and assembled in digital video, the image quality is absolutely solid and, dare I say, perfect for the material presented. The manipulation of colors and effects on the footage creates all sorts of interesting visual effects, but nothing is flawed or unintentional; it's amazing video quality to say the least. Digital problems are simply not present, and instead, is a highly stylized and specially crafted image that shows a lot of care in how it was presented. Audio Transfer Review: The musical score, as created by D. Bressanutti and P. Codenys, is not only good, but was specifically recorded and mixed into 6 channels for the Dolby 5.1 and DTS presentations. It's not often that music is actually recorded in 6 discreet channels for a DVD, and in this case, it paid off. The usage of all the speakers with the soundfield is simply amazing and Front 242 fans will go giddy with delight at this amazingly varied, textured, and bizarre electronic music creation. It's difficult to describe in words, but trust me, I doubt you will find a more unique sound experience anytime soon on DVD. Unfortunately, much of the multi-dimensional aspects are lost in the 2.0 Surround version, but it still works quite well given the limitations. Audio soundtrack CDLe Mans driver interviews. Driver InterviewsAdditional audio CD soundtrack. Members website access.Access to web content. Extras Review: On top of the two versions of Speed Tribe contained on the disc, there are a number of very good supplements. Kicking things off are three lengthy, audio-only interviews with Le Mans drivers Frank Biela, David Brabham, and John Nielsen. The interviews are well done and focus on many aspects of racing as well as the connections to the disc. This isn't your usual, fluffy kind of racing interview where it's the usual questions about "How will you win?" and such, but rather an approach that brings the drivers into the whole Speed Tribe motif by getting them to talk about the emotional aspects of their sport. The package contains a 65-minute audio CD that features the complete soundtrack of both versions of Speed Tribe as produced, composed, and re-mixed into 2-channel stereo by Daniel B. and Patrick C. This is, frankly, what will probably sell most copies of the disc, as eager fans (like me) have waited almost 10 years for a re-teaming of these Front 242 band-mates. The soundtrack does not disappoint, but it should be noted that people shouldn't buy this disc expecting a new F242 album; it's more of an ambient experimentation for the duo and less of a full-on industrial concert. Still, it's a fantastic CD to add to a collection, and makes for a wonderful part of the set. Each Speed Tribe package contains a serial number which can be used to get into a "members" section of the Tribe website hosted on Dance.Com. A lot of times weblinks and those sort of things can turn out lame, but the additional supplements here are impressive. On top of interviews with staff, desktop wallpapers, and pointing out an easter egg on the disc, there are some serious extra features. 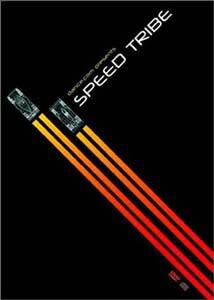 To begin with, the members website hosts Version 3 of Speed Tribe, which is a 6-minute QuickTime video (about a 62MB download) of yet another envisioning of the concept. There's about 32MB worth of unreleased D. Bressanutti/P. Codenys MP3 audio available on the site, as well as raw footage, and access to a discussion forum. Speed Tribe puts just about all other racing coverage discs to shame by elevating the idea into something more like art than simply a rote rehashing of the events. It's powerful, entertaining, and creates a new standard for similar projects while also proving the amazing qualities of the DVD medium.